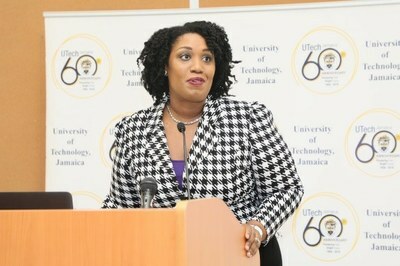 UTech, Jamaica Distinguished Public Lecture by CCJ President — UTech, Ja. 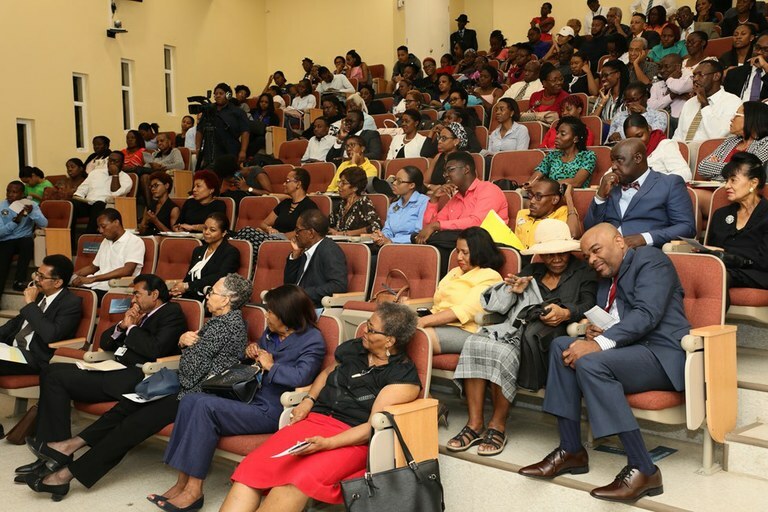 The Honourable Justice Adrian Saunders, President of the Caribbean Court of Justice (CCJ) delivering the UTech, Jamaica Distinguished Public Lecture on Monday, March 11, 2019 at Lecture Theatre 50, Shared Facilities Building, Papine Campus. At right is a section of the large audience which included Attorney General, Hon. Marlene Malahoo Forte, QC, Former Chief Justice Hon. Zaila McCalla, members of the judiciary, members of faculty, staff and students. 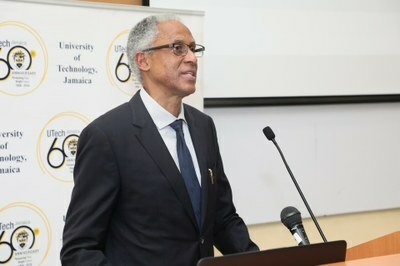 The Faculty of Law, University of Technology, Jamaica, as part of its 10th anniversary celebrations hosted a Distinguished Public Lecture delivered by The Honourable Justice Adrian Saunders, President of the Caribbean Court of Justice (CCJ) on Monday, March 11, 2019 at Lecture Theatre 50, Shared Facilities Building, Papine Campus. The lecture was on the topic The CCJ: Changing the Face of Justice. Justice Saunders gave a detailed review of the CCJ’s new Strategic Plan for 2019-2024 which focuses on the areas of Communication, Independence and Accountability, a High Performance Environment, Equality, Fairness, Integrity and Promoting the Rule of Law, as well as Organisational Capacity for Caseload Growth and Enhanced Regional Justice System Capacity and Performance. He invited the audience to review information about the Court and its work available at its website at www.ccj.org and at its social media sites on Twitter, LinkedIn and Facebook. 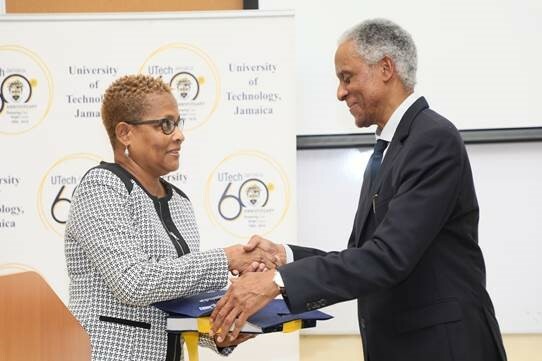 In his welcome, Dr. Prathiba Mahanamahewa, Dean, Faculty of Law thanked Justice Saunders, under whose leadership the CCJ Academy granted 15 scholarships to UTech, Jamaica undergraduate law students to participate last year in the CCJ conference held at the Jamaica Pegasus Hotel. The lecture was expertly chaired by Mrs. Shauna-Kaye Smith, Lecturer, Faculty of Law. The Vote of Thanks was moved by Mr Raun Barrett, Lecturer, Faculty of Law. Mrs. Joan Lawla, student, Faculty of Law presents Hon. Justice Adrian Saunders with an appreciation gift following his lecture. 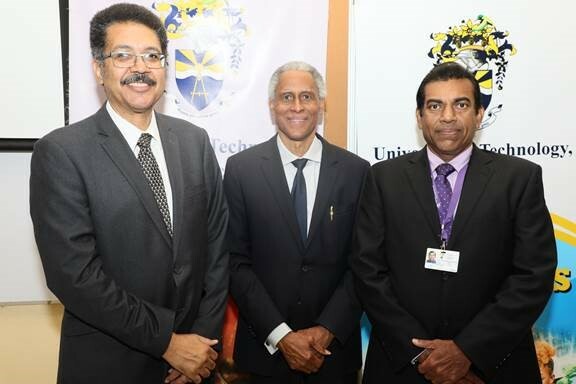 From left: Professor Stephen Vasciannie, President, UTech, Jamaica, Hon. Justice Adrian Saunders and Dr. Prathiba Mahanamahewa, Dean, Faculty of Law pose for a photograph following the Distinguished Lecture. Read more in the Gleaner publication dated Thursday, March 14, 2019 at link: http://jamaica-gleaner.com/article/lead-stories/20190314/ccj-revival-regional-judicial-body-crafts-plan-make-court-more .